Surgery is not always an option for those suffering with back pain relating to intervertebral disc problems, but for some, the possibility of having a disc replacement may be a viable option. Why do I Need a Disc Replacement? As we grow older part of the natural ageing process can mean that the discs situated between our vertebrae become worn. This wear and tear can cause a lot of back pain particularly in the lower region and can be very debilitating for the sufferer. Traditionally this has been treated with pain relief and the use of spinal fusion surgery in which some or the entire disc may be removed and the two surrounding vertebra fused together and bone growth stimulated to grow into the remaining space where the disc once was. 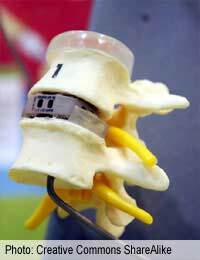 Recent research and development has lead to the introduction of disc replacement surgery which is seemingly working very well so far particularly in younger patients who are more likely to benefit from the increased mobility this procedure offers as opposed to the alternative spinal fusion type of operation. Can Anyone who Needs it have a Replacement Disc? Not all patients with worn discs will be suitable candidates for this type of surgery and your overall health, level of mobility and expected recovery will all be taken into consideration before you are considered for the operation. As the procedure is also in its infancy, the surgeons who perform the operation will be more likely to be selective in who undergoes the operation until more results have been created. The type of patients who are most likely to be assessed for disc replacement include those who are young and healthy, patients who have tried all other forms of relief for the condition, those who fully understand the nature of the operation and all the risks and those who have problems with only one particular disc who do not need multi-level surgery where several discs are affected. As with all kinds of surgery the operation is not without risk. This type of surgery will require the use of a general anaesthetic which carries its own side-effects and complications but as the patients for disc replacement tend to be younger the risks are fewer as the patients are often in better overall health than older patients. The nature of the surgery itself is not simple and only the most experienced and highly trained surgeons are permitted to perform disc replacement. The operation is very technical and is very invasive though all potential risks will be explained before surgery so that you are fully informed of all the facts before giving consent. It is essential that you ask all of your questions well before the surgery so that you and your family can discuss your options and make the right decision for your own individual needs. As with all spinal operations the recovery process means taking everyday at a time and not expecting to be fully mobile in just a few days. Patients will be visited by a physiotherapist during their hospital stay who will assist them in getting out of bed around 48 hours after the surgery. You will be given special exercises to perform that will aid your recovery and these should be followed exactly. Providing there is no reactions to the prosthetic material, no infections, no surgical or post-operative complications and compliance with all recommended post-operative advice given by the medical professions, patients may well be feeling fit again 6 weeks after the surgery though some forms of employment may mean you need slightly longer off work. Disc replacement surgery may not be available to all patients who have back pain relating to disc problems but as more and more research is carried out and the experts learn more about the procedure and the recovery process, the likelihood is that more patients will be able to benefit from the operation in the future.